NEW type of detective is stepping from the pages of fiction to fight the modern criminal. He is hunting the big game of the underworld with strange new weapons; following a trail of hidden clues with delicate machines that almost think; using, as the tools of his trade, . the thousand and one recent discoveries of science. 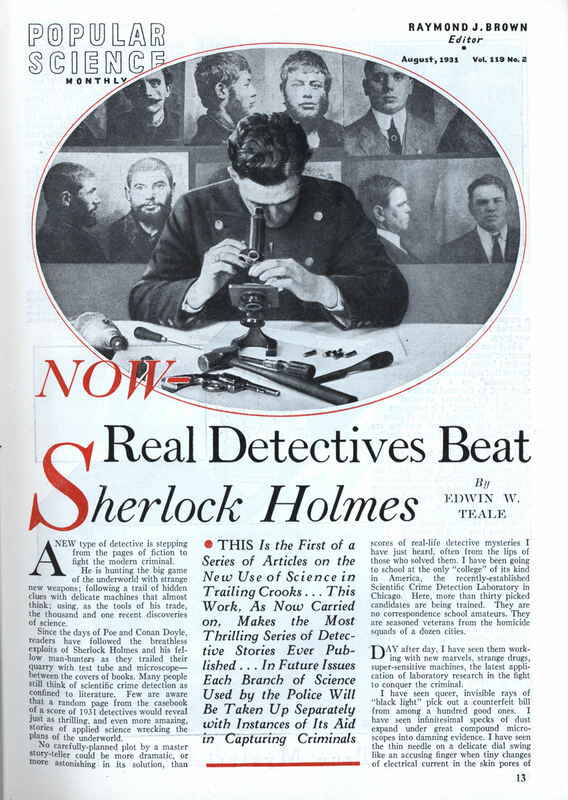 Since the days of Poe and Conan Doyle, readers have followed the breathless exploits of Sherlock Holmes and his fellow man-hunters as they trailed their quarry with test tube and microscope— between the covers of books. Many people still think of scientific crime detection as confined to literature. Few are aware that a random page from the casebook of a score of 1931 detectives would reveal just as thrilling, and even more amazing, stories of applied science wrecking the Plans of the underworld. No carefully-planned plot by a master story-teller could be more dramatic, or more astonishing in its solution, than scores of real-life detective mysteries I have just heard, often from the lips of those who solved them. I have been going to school at the only “college” of its kind in America, the recently-established Scientific Crime Detection Laboratory in Chicago. Here, more than thirty picked candidates are being trained. They are no correspondence school amateurs. They are seasoned veterans from the homicide squads of a dozen cities. DAY after day, I have seen them working with new marvels, strange drugs, super-sensitive machines, the latest application of laboratory research in the fight to conquer the criminal. I have seen queer, invisible rays of “black light” pick out a counterfeit bill from among a hundred good ones. I have seen infinitesimal specks of dust expand under great compound microscopes into damning evidence. I have seen the thin needle on a delicate dial swing like an accusing finger when tiny changes of electrical current in the skin pores of a suspect indicated he was lying. A LITTLE more than a year ago, the Scientific Crime Detection Laboratory was established. It grew out of the notorious “St. Valentine’s Day Massacre” in Chicago. On that day, seven men were lined up against a garage wall and riddled with machine-gun bullets. Colonel Calvin Goddard, famous firearms and ballistics expert, was called from New York to examine the lead and shells at the scene of the wholesale slaughter. His work in tracing the bullets to the guns of certain gangsters interested a group of public-spirited men who saw the need of a scientific crime detection school and laboratory and offered to provide the financial backing necessary. As director, Colonel Goddard gathered about him a corps of experts, and the laboratory opened last April on the fifth floor of a loft building near Lake Shore Drive. It is the latest link in a worldwide chain of scientific crime detection centers. Recently, to aid the police of different countries, a world clearing house for information about international crooks was established in Vienna, Austria. Another innovation is being tried in Germany. At Berlin and Dresden, handwriting specimens of known criminals are filed away with their fingerprints. One conviction a week has been the record of this bureau during the past year. Other scientific crime laboratories are operating in Paris and Lyon, France; Madrid, Spain; and Lausanne, Switzerland. The Chicago organization is the first of its kind to be established in America. AS you enter this fascinating workplace of scientific sleuths, you find yourself in a labyrinth of connecting rooms and corridors. At the center, ringed by chemical laboratories, photographic studios, and experimental rooms of half a dozen varieties, is the demonstration and lecture -hall. Here, rows of chairs and a blackboard in front with a roller movie screen beside it suggests the ordinary classroom. But the fifty big brown cases with glass fronts circling the walls indicate the grim business for which the students are preparing. They contain the captured guns of noted gangsters; collections of fingerprints and tire treads; examples of writing and typing that have figured in mysterious crimes. One is nicknamed the “pineapple crate.” It holds burned fuses, bits of shattered bombs, remains of deadly infernal machines. Another exhibits clothing worn by murder victims, covered with bloodstains now brown, as though made by varnish. Each object in this strange museum has behind it a nerve-tingling tale of crime and violence. Every case contains a dozen front-page stories. JUST outside the lecture room is the library. Its books on crime detection date back to 1689. 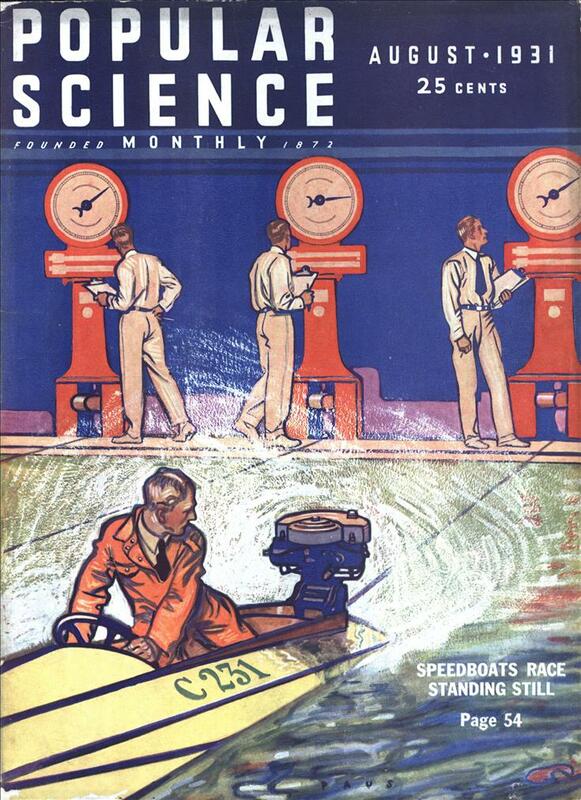 Popular Science Monthly and half a dozen other publications are kept on file and volumes on a wide variety of subjects are available for the research worker. For practically every reality of science is used by the modern criminal-hunter—chemistry, physics, microscopy, bacteriology, metallurgy, ballistics, toxicology—the list runs on indefinitely. Often subjects that seem far-removed from crime come to the aid of the baffled officer. Take entomology, the study of insects and their habits. That apparently offers little in solving a murder mystery. Yet, in half a dozen cases it played the deciding role. In one, it placed the finger of justice upon the guilty person, who thought himself safe, weeks after the crime was committed. THIS was the famous “Home Brew Murder Case,” which, some years ago, attracted world-wide attention because a microscopic, blind beetle finally led officers of the law to the house of the slayer! The body of the victim was discovered hidden among the weeds in a vacant lot. It was evident that he had been dead for some time, and there appeared to be no clues to his slayer. Carefully placing the clothes of the murdered man in a paper bag, the scientific detective in charge beat them with willow wands until all the dust they contained was at the bottom of the container. Examining this carefully with a high-powered microscope, he found two interesting things. One was a number of specimens of a tiny sightless beetle found only in dark cellars. The other was a quantity of yeast spores of the type used in making beer. This indicated that the body had been kept for some time in a dark cellar in which beer was being brewed. After listing all persons who had possible motives for the killing, the detective examined their cellars. A In scraping the walls in one basement, he discovered large numbers of the blind beetles. In a dark corner, not far from the home brewing outfit, he also detected a dark stain. Analyzed in the lab-oratory it . proved to be blood. When confronted with this evidence, the suspect confessed and the mystery was solved. In examining stains to determine if they were made by human blood an entirely new method has been evolved. Carnegie Institution scientists, in Washington, D. C., discovered that the crystals of hemoglobin, the material forming the red corpuscles, have a peculiar shape in the human life stream by which they can be recognized. ANOTHER method of analysis carried on in the chemical laboratory has been perfected by Dr. L. Hektoen, of the McCormick Institute, Chicago. By it, he can detect human blood in solutions having only one part hemoglobin to 50,000 parts water. In one case, he was able to take tiny shavings from a floor that had been carefully scrubbed after a crime and . determine the presence of human blood! In a score of other ways the chemical laboratory comes to the aid of the scientific detective in his fight on the modern criminal. In a New York robbery, a year or so ago, entry was made into a building by filing through a lock. A suspect was picked up by the police. His alibi seemed sound until experts examined the dust in one of his trouser cuffs. It contained several glittering particles like gold. An analysis in the chemical laboratory showed these specks of metal to be composed of the identical alloy used in the lock that had been filed. Dust and microscopic bits of matter are always scrutinized carefully by the trained hunter of criminals. In one instance, the dust on a pair of shoes was examined steadily for fifteen hours in a laboratory. The evidence obtained resulted in a conviction. In the West, a few years ago, the famous D’Autremont train robbery was solved through dust found in the pockets of a pair of overalls discarded by the fleeing bandit. The dust was from a peculiar-colored soil and indicated to railway detectives that the robber had come from a certain small area in a particular locality. IN FRANCE, Edmund Locard, the famous scientific detective of Lyon, has catalogued hundreds of common dusts and worked out rapid tests to identify them. Similar to this catalogue of powdered particles is an atlas of fibers published for the benefit of detectives in 1929 by an English doctor. It records the characteristics of plant and animal hairs which, not infrequently, play an important part in detective work. What a microscopic examination of such bits of matter will reveal to an expert eye was dramatically illustrated in the quick solution of a bombing case in Berkeley, Calif.
Four sticks of dynamite, tied together with a cotton twine, had been found beside a house in the suburbs. The unexploded bomb was brought to the Berkeley headquarters and turned over to Dr. Albert Schneider, director of the police laboratory. Removing the cotton string, he placed it in a container of clear water and shook it violently. Later, he poured off the liquid and examined the residue with a powerful microscope. As a result of this examination he was able to announce that the twine had come from a farm where there was a fast-running stream of water,- pine trees, several varieties of shrubs, black and white rabbits, a bay horse, a light cream-colored cow, and Rhode Island Red chickens! Incredible as it seems, this apparently fantastic statement was later proved correct in every detail! New apparatus and improved technique are constantly increasing the uncanny skill of such scientific bloodhounds of the law. Some of the recent aids that have been developed to speed up the work of trailing criminals are: folding compound microscopes for use in the field; portable arc lights providing illumination for hunting tiny clues at night; “pill box” cameras occupying little space and taking clear pictures on minute ribbons of film; electrically-operated tear-gas guns; and radio police cars, cruising the streets, ready to dash at fire-engine speed to the scene of a crime when an aerial message is flashed from headquarters. Predictions for the future are that delicate instruments detecting lies by changes in breathing, blood pressure, and body electricity will replace the “third degree” and that a “walking and talking rogue’s gallery” of sound movie films will replace the picture files of the present. IN VIENNA, Austria, a rare plastic substance called “moulage” has recently been put to work helping detectives. It records in permanent form such fleeting evidence as fingerprints in dough, teeth marks in fruit, and footprints at the scene of a crime. This colloidal mixture has just been introduced into America by the Scientific Crime Detection Laboratory, where a special moulage room has been established in charge of an expert. During the last year, rays of invisible light, such as the ultra-violet and the “black light” of the infra-red, have helped solve an increasingly number of crimes. Ultra-violet rays will detect almost instantly counterfeit bills, spurious gems, erasures in forged checks, and differences in dusts that appear alike. On the outskirts of Paris, France, the body of a woman who had been brutally murdered was found by the police. The only clue to the identity of her slayer was a small piece of hair which had caught under one finger nail as she grappled with her assailant. When this hair was placed under an ultraviolet light, a strange thing happened. It seemed to burst into purplish fire, glowing with the exact shade peculiar to aspirin. IN TRACING the history of the woman, the police had picked up three suspects who might have had a motive for the killing. A hair from the head of each was brought to the laboratory and exposed to the ultraviolet rays. Two remained dull but the third, from the head of a man who took aspirin regularly in such quantities that it was given off by the scalp pores into the hair, burst into the purple, telltale sheen which marked him as the murderer. A knowledge of metals, and the thousand and one alloys in common use, is frequently an ace card in the hands of the real-life Sherlock Holmes of today. An unusual case of this sort occurred not long ago in Wisconsin. A farmer who owned a large cornfield bordering a railroad sued the transportation company for thousands of dollars, claiming his herd of blooded cattle had_ been killed through carelessness of the section crew. He maintained that the workmen, in laying new rails, had thrown the connecting wires they removed from the old ones over the fence into his cornfield. These wires, he said, got into the corn shocks and were cut into fine pieces in the feed choppers. As a result of eating the little pieces of metal, his complaint read, his whole herd died. A SCIENTIFIC detective was called by the defendants. He analyzed the stomach content of several of the dead animals and found the bits of wire, just as the farmer had reported. He next took several to his laboratory and measured them. They were exactly the same diameter as those used on the rails. But, when he made a metallurgical examination of the death-bringing bits and of the standardized metal in the railroad connections, he found that, although they looked alike, they were of entirely different compositions. The farmer had purchased wire of the exact diameter of the rail connections, cut it up and fed it to his animals in a plot to mulct the company. In this case, as in a host of others that will be reported in the succeeding articles of this series, the detective with the trained scientific mind played the stellar role. Such men begin where the ordinary officer leaves off. Working slowly, painstakingly, utilizing every branch of science at hand, these modern man-hunters are arriving at astonishing solutions in baffling crimes. Their work is analytical, methodical; but their results are amazing, magical. WATCH for the next installment of this vivid series. Learn of the amazing feats of modern crime detection in which human blood is the only clue. See Popular Science Montly for September on sale August first. A real detective beats a fictional detective?